Baggers define the modern American dream – but can Indian’s new Springfield depose the Road King? merican motorcycles don’t get more definitive than Harley-Davidson. And of all American bikes and all Harley-Davidsons they don’t get any more popular than that of the ‘bagger’ and, specifically, H-D’s original interpretation of that breed – the Road King. Which is why the latest offering from Harley’s reborn US rival Indian, the Springfield, is about as bold and ambitious as American bikes get. Launched in March at the home of American biking, Daytona Bike Week, the Springfield is a direct rival for the Road King as a classic bagger cruiser. ‘Baggers’, in case you’d forgotten or just beamed down from the planet Zog, are cruiser/tourer hybrids which blend laid back custom style with the practicality and comfort offered by a touring screen and panniers or bags – hence the name. And that blend of style and practicality has, in the last decade or so, become very popular, particularly in the US where custom style and long distance comfort are two of the biggest themes in biking. And when I say ‘very popular’, I mean ‘huge’ – huge to the extent that there are now US magazines and even TV shows dedicated to baggers. To give an idea of the scale: when Harley’s latest bagger offering, the Street Glide, was updated in 2009 it became H-D’s biggest seller in the US, and famously outsold every imported motorcycle into the country combined. That’s huge. With all that in mind it’s probably no real surprise, then, that Indian want a slice of that pumpkin pie. The new Springfield is the bike that attempts to do just that. Although you’d be forgiven for thinking it’s a mash-up of two existing Indians, having the hard-panniered rear of the Chieftain blended with the Plexiglass screened front of the Chief Vintage, it’s actually a virtually all-new bike with a chassis all it’s own – just one example of the lengths to which Indian have gone to take on the Road King. But is the Springfield a serious rival? No-one foresaw it when it was launched, but the Road King has gone on to become not just one of Harley’s longest lived and most popular models but also to inspire and define the bagger class. Launched in 1994, effectively as a re-branded ElectraGlide Sport, the Road King succeeded by blending two attractive virtues – style and practicality. Practicality came from being based on Harley’s proven ‘Dyna’, twin shock, ‘FL’ tourers which gave a smooth and plush ride complete with useful panniers all powered by H-D’s then 1340cc version of its big twin. Style arrived via paring the touring stuff back to a minimum (leaving just the twin bags), fitting a lightweight, detachable Plexiglass screen and ladling on a hefty dose of ’50s chrome and detailing. It was a formula which proved such a success that, subtle evolutions aside, through 1450cc and 1690cc, the recipe’s remained the same ever since. The biggest changes came in 2012 when the Road Glide received the new ‘High Output Twin Cam 103’ engine, brighter headlamps, cast wheels (including a 17-inch in place of the old 16in front), floating discs with Brembo four-pot calipers and ABS, a new fork, restyled saddlebags and more. And though fundamentally unchanged since, those changes brought it sufficiently up to date to not require it – at least, not until now. 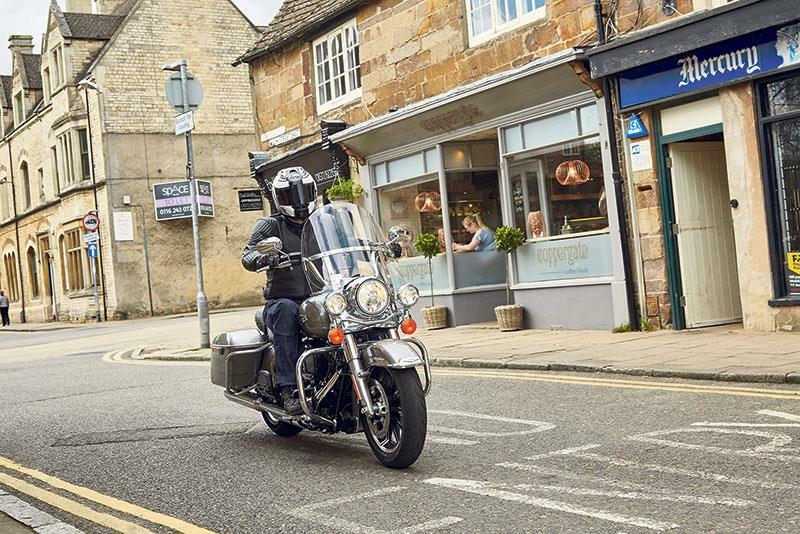 With the Road King what you see is what you get – with the bonus that you no longer need to make excuses for brakes, suspension and equipment that were once as old-fashioned as its styling. Those re-badged Brembo stoppers are not just up to contemporary standards, they’re verging on sharp. The suspension and handling’s decent with no major worries. The now 1690cc, fuel-injected twin is punchy plus there’s cruise control as standard and a switchable readout on the clocks, all now happily up to cruiser par. 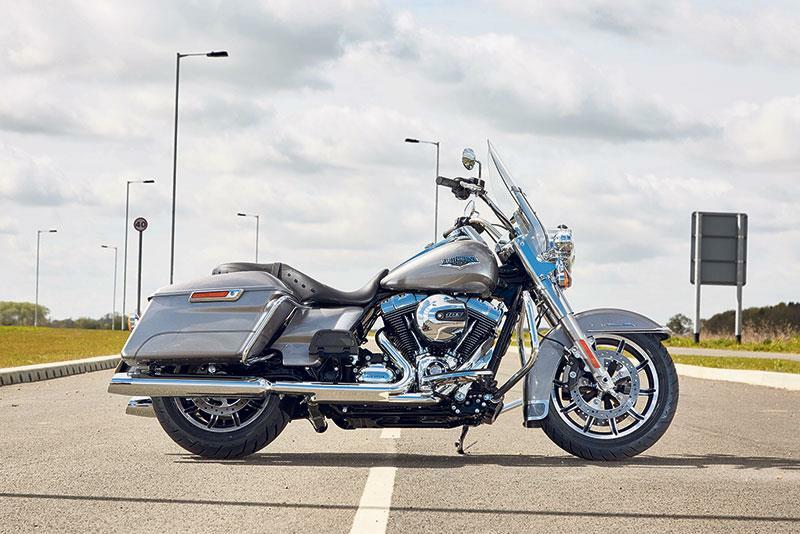 Instead, what sets the Harley apart is its (quite literally) classic cruiser style, the name on the tank and more manageable proportions than you might expect – and that’s it. 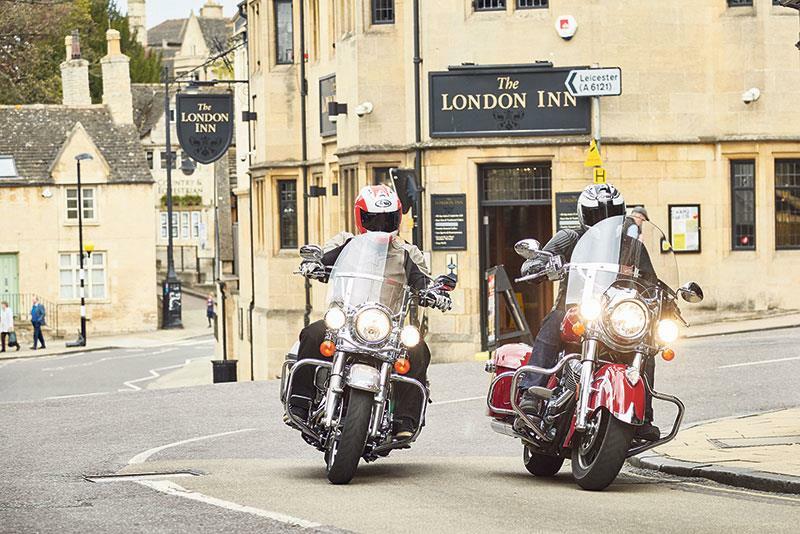 There’s no stand-out features or dynamics, the Road King is simply typical, classic, Harley big twin tourer and if that’s what you want then you won’t be disappointed. Trouble is, Indian now offers the Springfield, too. Going into this test, having earlier sampled the Springfield at its Daytona launch, I suspected the newcomer would run the benchmark Harley close. Both share very similar features, ranging from their grunty air-cooled twins, screens and panniers right the way to ABS, cruise control and so on. But after a full day riding both I and co-tester Jon Urry agreed: the Indian beats the Harley in virtually every area imaginable. 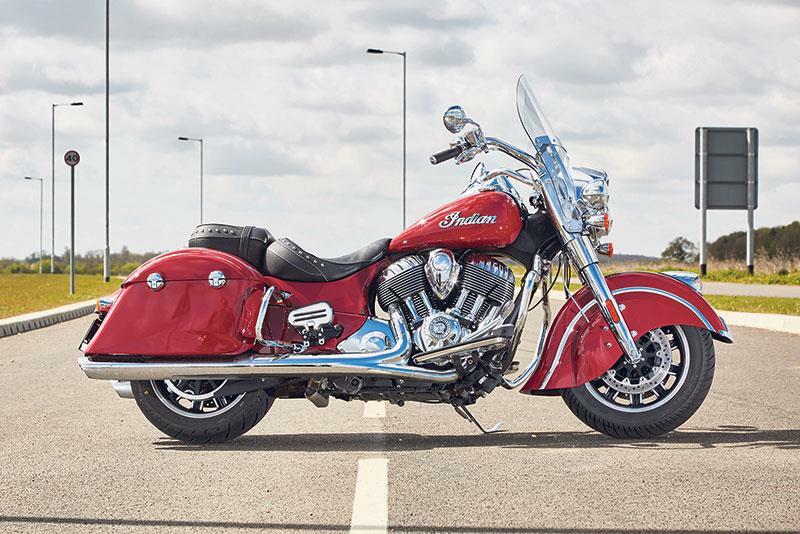 At standstill, where the Harley is pleasing, the Indian is stunning. With the Springfield there seems to be just more and better of everything. More chrome; more neat Indian badging and detailing; nicer mirrors and grips; a leather not vinyl seat; that glorious engine, those bolder styling sweeps such as the flared fenders and war bonnet mascot. What’s more, the Indian is slightly bigger, longer and heavier all round (which makes its presence felt at standstill but disappears on the move). And, from the country where more is usually considered better, that’s good, too. But best of all is how the Springfield goes, and here, more than anywhere else, the Indian’s got the Harley beat. The Springfield, like all big Indians, has a pleasing dash-mounted starter button to go with its keyless ignition. Then it settles into an instant, soft rumble more soothing than the comparatively staccato Harley. Though larger, the Indian’s no more of a handful. Somehow its weight seems lower while its sharper geometry (Indian changed the steering head angle of the Springfield to suit its different fairing) means it steers just as precisely while simultaneously being more stable. Thunderstroke motor feels the gruntier yet more fluid of the two; its seat is more comfortable and cossetting (both of us slid forward on the brakes on the vinyl Harley) and the view is more pleasing. The Indian’s instruments are easier on the eye and more comprehensive, with a gear indicator, too. All things considered, there were only two aspects of the Harley I preferred: first, its screen generated slightly less turbulence, plus I also prefer its ‘heel-toe’ gearchange (it is an option on the Springfield). That, however, is it. Yes, I know it’s not quite the whole story. While the Indian is dynamically better in every way plus better equipped and detailed, it’s also more expensive than the established, proven and loved Harley – and for a newcomer, that’s a big ask. 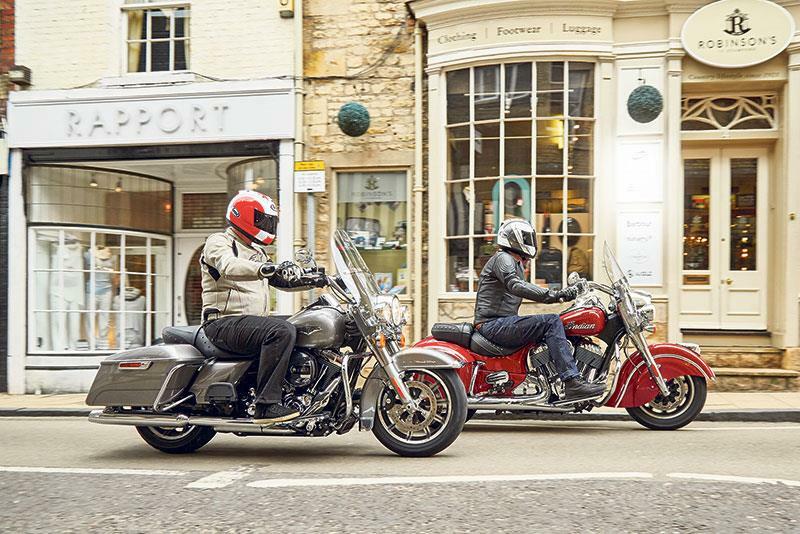 Nor is the Harley a bad bike – far from it: the Road King delivers everything you expect. 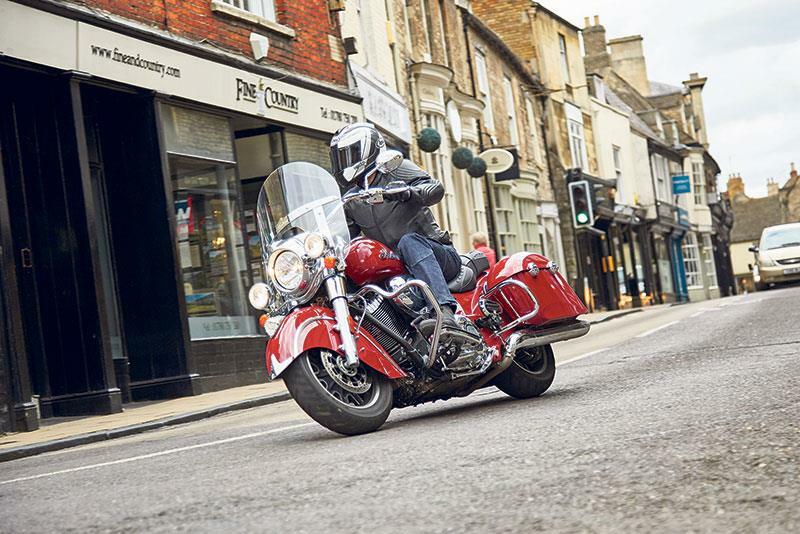 It’s just that the Indian delivers more in every respect and, with the added reassurance of a five-year warranty and Polaris backing, that ‘more’, particularly in a genre where ‘more’ is usually better, makes it the best. Engine: Air-cooled, 1811cc (101 x 113mm), 2v, pushrod, 49° V-twin. Six gears, belt drive. Suspension: 46mm telescopic forks, no adjust, front; twin shocks,air adjust, rear. Engine: Air-cooled, 1690cc (98.4 x 111.1mm), 2v, pushrod, 45° V-twin. Six gears, belt drive. Suspension: 49mm telescopic forks, no adjust, front; twin shock, air adjust, rear.